The Free Laptop Scheme in Uttar Pradesh was actually announced during the reign of the Samajwadi Party. The then CM of the state was Akhilesh Yadav. But after Yogi Adityanath captured the political throne of the state, he took up the task of implementing the scheme. Via this scheme, the good students of 10th and the 12th class will stand a chance of getting a laptop from the state government. The actual date of the announcement of the free laptop scheme was done during the month of March, 2013. It was announced by the then reigning Chief Minister of the state, Akhilesh Yadav. In the year 2017, there was a change in the political scenario and the government went into the hands of Yogi Ji. Adityanath allocated a new budget to the scheme for its successful implementation. 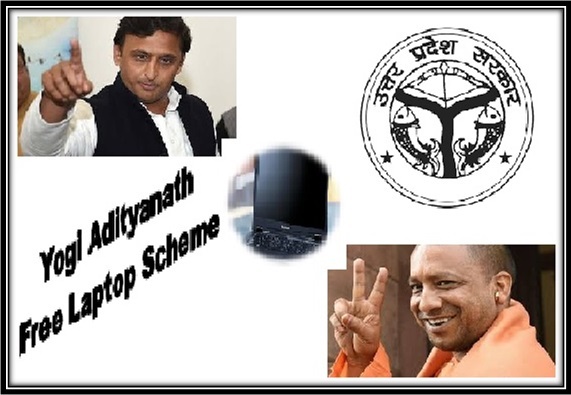 For the residents of UP – It has been announced in the draft of the free laptop scheme that the students, who will be able to apply for the program must be residents of the state. They must have the residency certificate to prove the claims of residency. For meritorious students – It has also been mentioned that the scheme will benefit the students who have passed the 12th and 10th standards. That is not all. Only those students will be allowed to register who have acquired high marks. Opting for higher education within the state – Last but not the least, the scheme is a ploy by the state government to keep the meritorious students from migrating to other states. The free laptop will be awarded to only those who have taken admission for higher education in UP itself. Online registration – If any student is interested in getting the free laptop from the state government, they will have to register for it. The registration process must be done online and no offline method has been delineated by the authorities. Laptops and tablets – All the selected students will be provide with either a laptop or a tablet. The gadgets will assist the students in gathering information about their course and hence, pave a path for acquiring success. The uplaptop-tabletdistribution.in is the official website address of the scheme. Any student, who fulfills the required criteria and are interested in pursuing higher education in the state, must click on the link and register their names accordingly. They will also have to provide details as mentioned on the site. Nothing has been declared by the state government about the date of starting and ending the registration process. It is expected that the activities will start from the month of December, 2017. Till the official announcement, one needs to keep a close watch on the updates. All interested candidates will have to click on the official web link. When the page opens, they will have to click on the appropriate link that will assist in the proceeding with the registration procedure. The link will only become active when the task starts. When the appropriate link will be opened, the student will get the online application form. Then they will have to fill in the details that have been asked in the form. Once the form has been filled, it must be submitted for the consideration of the claims. Once the successful submission of the form has been done, the site will generate a code automatically. The student must note the code and then wait for the declaration of the beneficiary list. After the closure of the registration date, the authority responsible for the selection will verify the claims and select the students accordingly. The selection process will be done on the basis of the marks they obtained in the exams. Once the list is prepared, it will be uploaded on the official website. Once the final list is declared, all registered candidates will have to download the PDF and check whether their name features on the list or not. It must be remembered that the announcement of the free laptop scheme was the brainchild of Akhilesh Yadav. But as the viability and popularity of the scheme was still riding high on the minds of the students of UP, the present Yogi government decided to go on with it. During the rule of Yogi Ji, the state announced a budget of whopping Rs. 1800 crore. The money is to be spent on the procurement of around 12 lakh laptops for the deserving and meritorious students. With the assistance of the scheme, the state government will be able to provide the deserving candidates with the laptops. It will assist them in attaining higher education in the future. The laptop in their possession, they will be able to invest more money for getting the admission in colleges and universities.